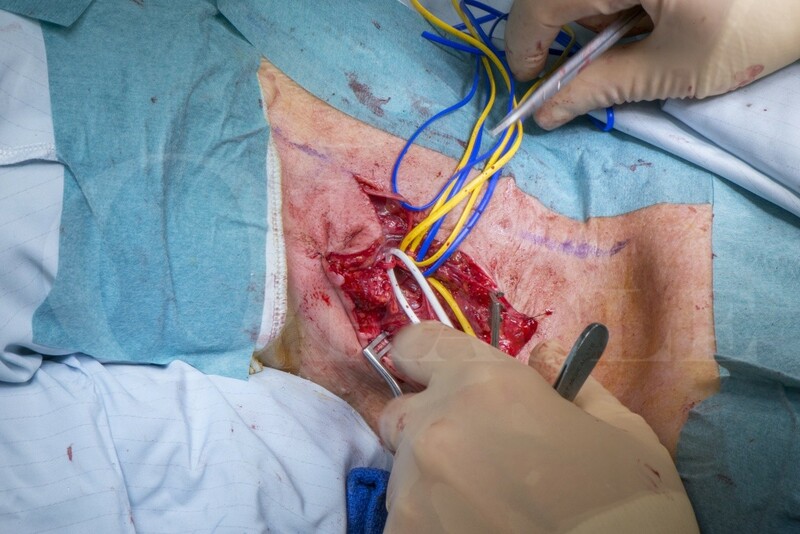 Learn the Spinal Accessory nerve reconstruction using autologous sural nerve graft surgical technique with step by step instructions on OrthOracle. Our e-learning platform contains high resolution images and a certified CME of the Spinal Accessory nerve reconstruction using autologous sural nerve graft surgical procedure. The spinal accessory nerve is the XIth cranial nerve and it traverses the posterior triangle where it is prone to injury in neck dissections for lymph node biopsies. Superiorly the nerve passes from the junction of the upper 1/3 and distal 2/3 of the sternocleidomastoid to the junction of the upper 2/3 and lower 1/3 of the trapezius in the lateral and posterior aspect of the posterior triangle. The nerve supplies the sternocleidomastoid then as it travels laterally it branches supplying a lateral branch to the upper lateral trapezius and a medial branch which passes posteriorly and inferiorly to supply the medial and lower trapezius. The XIth nerve passes to the neck in close proximity to the cervical plexus nerves, the supraclavicular nerves and the great auricular nerve. These sensory nerves may be affected in an iatrogenous injury following a neck dissection and the patient may present with dysaesthesia, hypoaesthesia or anaesthesia in the clavicle area and over the ipsilateral ear lobe. The examination should include looking for a Tinel’s sign at the point of potential injury. Damage to the XIth nerve distal to the sternocleidomastoid branch results in wasting and paralysis of the ipsilateral trapezius with drooping of the shoulder and loss of the definition of the posterior boundary of the posterior triangle resulting in neck and shoulder asymmetry.